Use of cards equals acceptance of following terms. 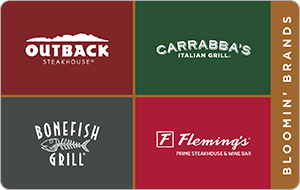 Redeemable at any Bloomin' Brands restaurant locations in the United States. Also redeemable at Outback Puerto Rico and Guam locations. Card has no replacement value if lost or stolen. No returns and not redeemable for gift cards or cash except where required by law. Treat this card as cash. For locations and balance information visit bloominbrands.com.